Chris Tucker is an international award-winning actor and comedian best known for playing the role of Detective James Carter in Brett Ratner’s Rush Hour film series. He became a favorite on Russell Simmons’ HBO Def Comedy Jam in the 1990s and came to prominence in his first starring role, the 1995 film cult classic Friday starring along- side Ice Cube which also celebrated its 20th Anniversary in 2015. In 1997, Tucker em- barked on his first production as executive producer and co-starred in the hit movie, Money Talks with Charlie Sheen and shortly after appeared in the highly successful Luc Besson’s The Fifth Element. In 2006, Tucker negotiated an unprecedented $25 million salary to appear in Rush Hour 3, which at the time made him the highest paid actor in Hollywood. Chris Tucker co-starred in the 2013 Oscar®- nominated film Silver Linings Playbook with Robert DeNiro, Jennifer Lawrence and Bradley Cooper. In 2015, his first standup film, Chris Tucker Live, was released exclusively on Netflix, and marked the first project that Tucker has starred in and produced through his company, Chris Tucker Entertainment. Tucker’s latest project is Ang Lee’s powerful Iraq war-centric film, Billy Lynn’s Long Halftime Walk co-starring with Vin Diesel and Steve Martin, which was released in theaters in November 2016. To date, Tucker has starred in films that have collectively grossed over one billion dollars in box office sales world- wide. He is currently on a successful U.S. and international 2017 comedy tour, receiving rave reviews from all over the world. 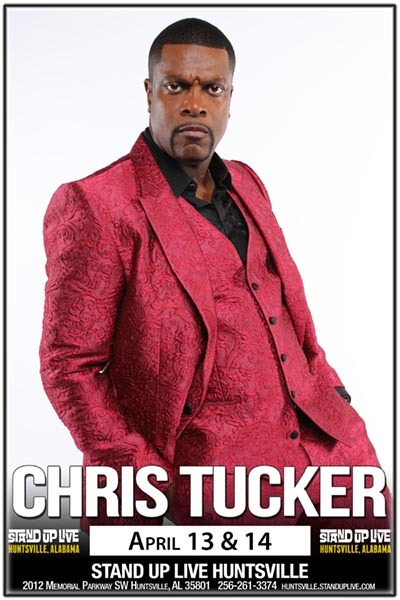 Outside of comedy, Tucker is a dedicated humanitarian, spending much of his spare time traveling around the world, doing philanthropic work to make a difference through his Chris Tucker Foundation.Outside of comedy, Tucker is a dedicated philanthropist and humanitarian, spending much of his spare time traveling around the world, doing philanthropic work to make a difference through The Chris Tucker Foundation.